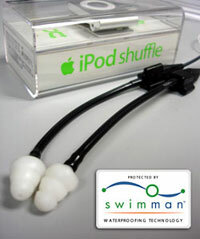 SwimMan has introduced the first waterproofed 2nd Generation iPod Shuffle. SwimMan has been making H20-friendly music possible for over 10 years. Applying their proprietary internal waterproofing technology, SwimMan has made the iPod Shuffle waterproof without the need for a bulky case that would detract from the shuffle’s sleek anodized aluminum body. The company sells the waterproofed shuffle on its own ($150), or bundled with SwimMan’s Waterproof Headset II ($119). SwimMan’s high-fidelity headset is also waterproof, featuring sound-isolating design. The shuffle/headset duo is priced at $250.